His Excellency Charles Angelo Savarin has stated that he is honored to have been sworn in as President of Dominica for a second term in office. He was officially sworn in at a ceremony held on Tuesday, October 2nd at the Goodwill Parish Hall. Justice Bernie Stephenson administered the Oath of Office to His Excellency Charles Savarin to serve as President of Dominica for another five years. “I ,Charles Angelo Savarin, do swear that I will faithfully execute the Office of President of the Commonwealth of Dominica without fear or favor, affection or ill will, and that in the execution of my functions of that office, I will honor, uphold, and preserve the constitution of Dominica, so help me God,” His Excellency President Charles Savarin stated. In his first address to the nation as President of Dominica for his 2nd term, President Savarin expressed his gratitude and honor to be elected for a second term. “My wife Clara and I, and members of my extended family, express our thanks and our appreciation to the Honorable Prime minister and members of the House of Assembly favor electing me to serve as President of Dominica for a second five year term,” he noted. He noted that he is “happy and honored” to have been given this privilege for a second time. 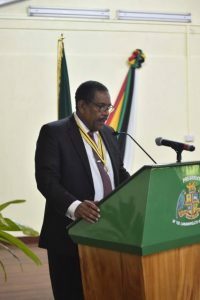 “On Monday, the 1st of October 2018, you again demonstrated that you thought me worthy of this honor, an honor I am further pleased and honored to accept and to continue to serve as president as we observe our 4oth year of Independence, under the theme “My love, My Home, My Dominica, Building a Resilient Country,” President Savarin added.